The House of Detention is a totally unique, atmospheric and historic 9000 sq/ft venue, deep in the heart of Clerkenwell. Nestled within the hub of London's design and creative district, lies the House of Detention. 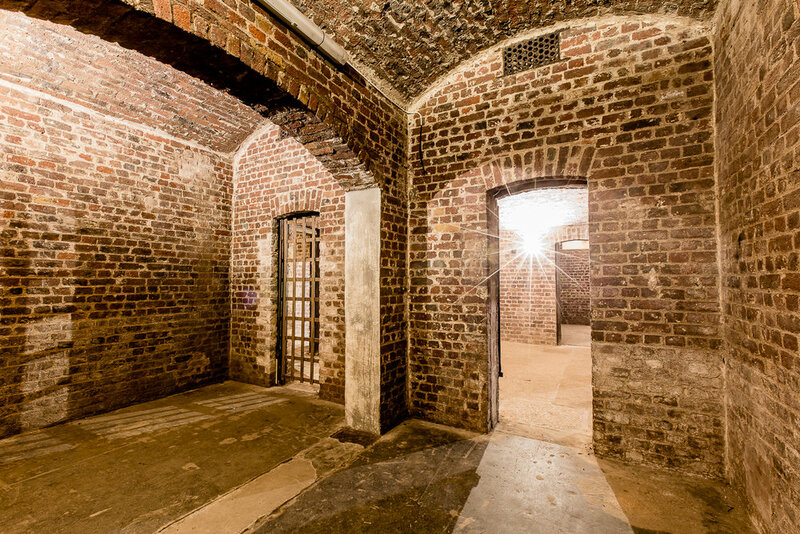 Formally a prison and built in the 17th Century, this 130 standing venue has a long turbulent history. It was one of the busiest prisons in Victorian times, and well known for its attempted inmate escapes, as well as being used as an air raid shelter during the Blitz. Today, it's a distinctive venue space perfect for product launches, presentations and immersive events. The cavernous, segmented chambers hold the infrastructure to cater to almost any type of event, offering space that it is impossible to find elsewhere in popular post codes for commercial events in London. Where else can you offer exhibitors packaged up space in individual prison cells? Please note - this venue only accepts corporate events. Due to council restrictions, we cannot hire the venue later than 11pm and guests should be offsite by 9:30pm. This space is partially outside and exposed to the elements. During wet or winter months your guests will require appropriate clothing. We also will not accept the following: warehouse rave parties, loud music events, or any events with a paranormal or ghost theme.